The Primer module will equip the total beginner with basic electric guitar playing aptitude applicable towards a wide spectrum of songs. With careful attention to the handling of this instrument’s potential, the student will have the right platform to advance to a greater playing responsibility. Thematic Devotion: Explore what made King David a man after God’s heart. 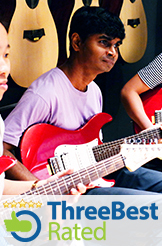 his step-by-step course is designed for total beginners who have absolutely no prior knowledge in music or the guitar. Individuals who attended other beginner courses but are still unable to play confidently and effectively are advised to join this Primer Module. What you are going to learn here is going to be fun, powerful and practical for your personal worship. Adopt a heart of worship right from the start.